Another couple of beauty brands have had their knuckles rapped this week, with Lancome and Maybelline being directed to remove adverts by the Advertising Standards Authority. Both brands are owned by the cosmetics giant, L'Oreal. 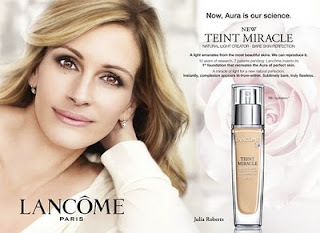 The ads feature celebrity spokeswomen Julia Roberts and Christy Turlington respectively. I have to admit that I tend to assume that airbrushing, false lashes and hair extensions are used as the norm in beauty advertising so I'm surprised that the ASA has taken such a stance on this occasion. What do you think? Do you take advertising imagery with a pinch of salt? Do you wish for greater honesty in advertising? Comment & let me know! Yes, there should be more honesty in beauty ads, for two reasons. One, some of the airbrushing is so ridiculous that it makes the women look alien-like. It's just getting out of hand. And two, the standards of beauty have become too extreme. According to these ads, a woman has to be stick thin, young, have the most perfect skin, high cheek bones, and look like a movie star/model in order to be considered a beauty. So, yes, I vote for more honesty in these ads. I always thought air brushing was useful for makeup that wasn't perfect like a wonky lip line or mascara that strayed too far south but this is beyond stupid. This is why reading beauty blogs has become so important as there is the honesty in the before's and after's.